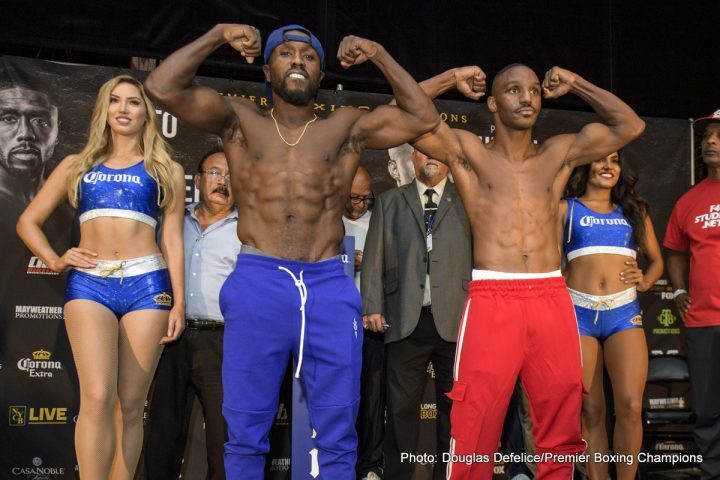 By Jim Dower: Andre Berto (31-5, 24 KOs), Devon Alexander (27-4-1, 14 KOs), Peter Quillin (33-1-1, 23 KOs) and J’leon Love all made weigh on Friday for their fights this Saturday night on Premier Boxing Champions on Fox and FS1 from the NYCB LIVE, Uniondale, NY. 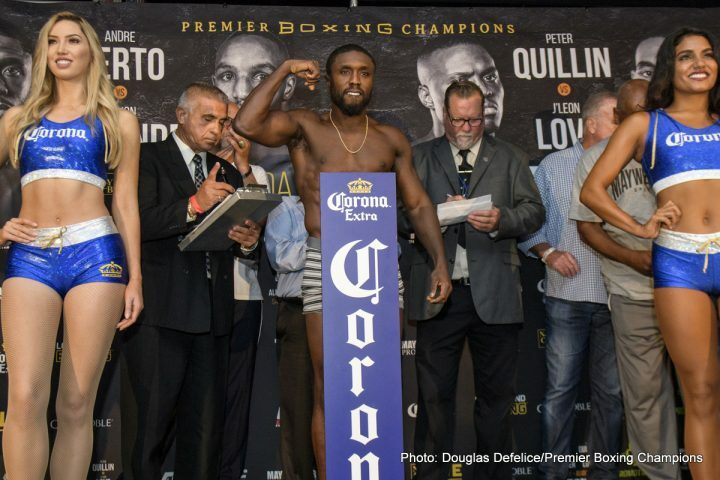 Former IBF/WBC welterweight champion Berto weighed in at 146 pounds. 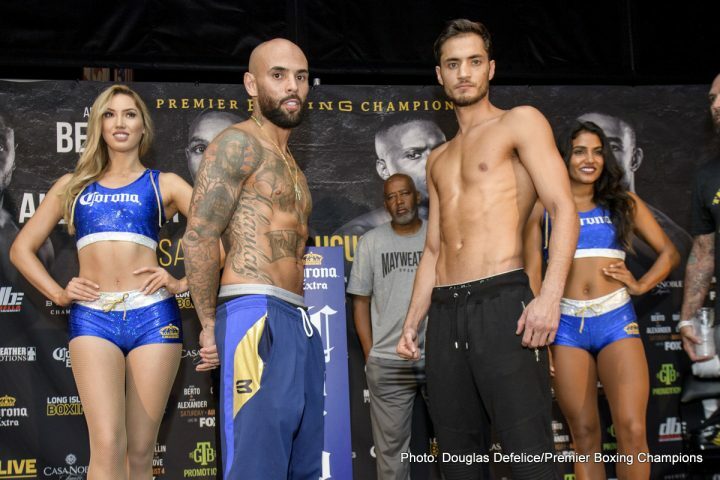 His opponent 31-year-old former two division belt holder Alexander weighed in at 146.8 pounds for their 12 round bout in the main event on the card. This is a make or break fight or Berto and Alexander. They both need a ‘W’ to keep their sagging careers alive. 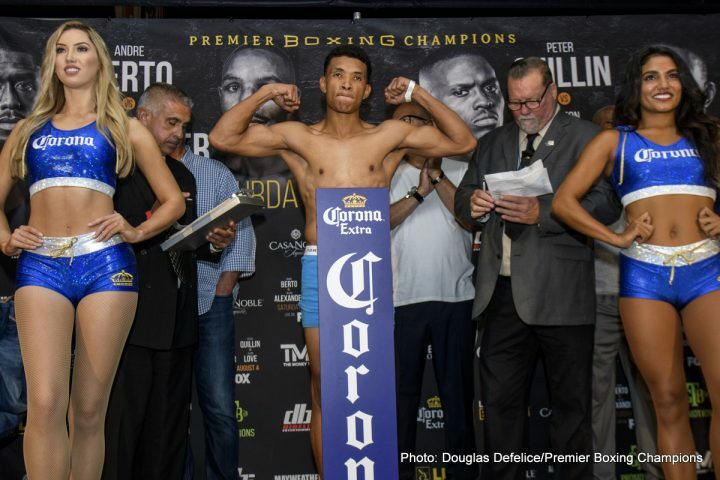 But even the winner of this fight is going to be food for IBF welterweight champion Errol Spence Jr. For intents and purposes, the Berto-Alexander fight is picking out a future victim for Spence to crush. There’s little chance that Alexander or Berto can hang with Spence for more than five or six rounds. In Berto and Alexander’s best years of their careers, they would be easy work for Spence. Still, Berto vs. Alexander is an interesting fight for entertainment value, but the winner of the fight isn’t going anywhere in the welterweight division. There are currently no world champions a 147 that Alexander or Berto would have much chance of beating. If they’re fine with being a gatekeeper type of opponent, ten it’s all well and good, but as far as them being a threat to the likes of Spence, Manny Pacquiao and Terence Crawford, they’re simply not a threat. They’re easy marks for those guys. 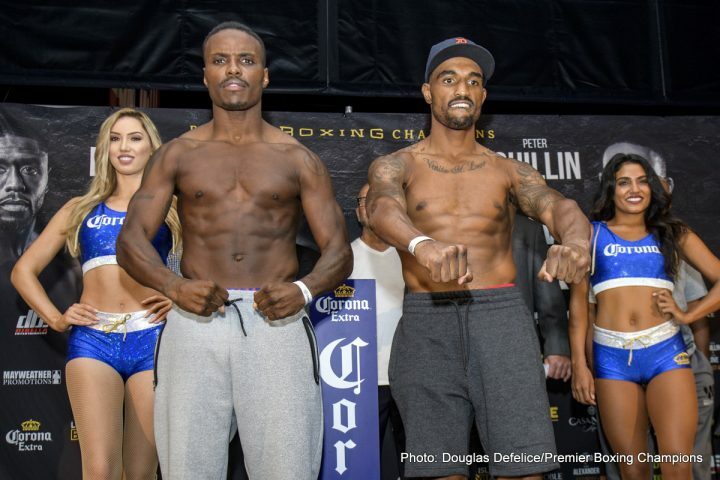 In the co-feature weights on Saturday’s PBC card, the 35-year-old Quillin weighed in at 167 pounds for his fight against 30-year-old Love. This is the last chance saloon for Quillin. If he can’t beat the likes of Love, then it suggests that he’s at the end of his rope with nowhere to go in the 168 pound division. Quillin has frittered away his once promising career with inactivity since giving up his World Boxing Organization middleweight title without a fight by vacating it in April 2014. That was easily the biggest mistake of Quillin’s career. He took a year off after vacating his career, and he’s never been the same. Quillin lost to Daniel Jacobs by a 1st round knockout in 2015 shortly after returning from a year layoff from the ring. First, Quillin fought to a controversial 12 round draw against Any Lee earlier in 2015. Most boxing fans believe that Lee deserved the win. However, the fight took place in Quillin’s hometown of Brooklyn, New York. 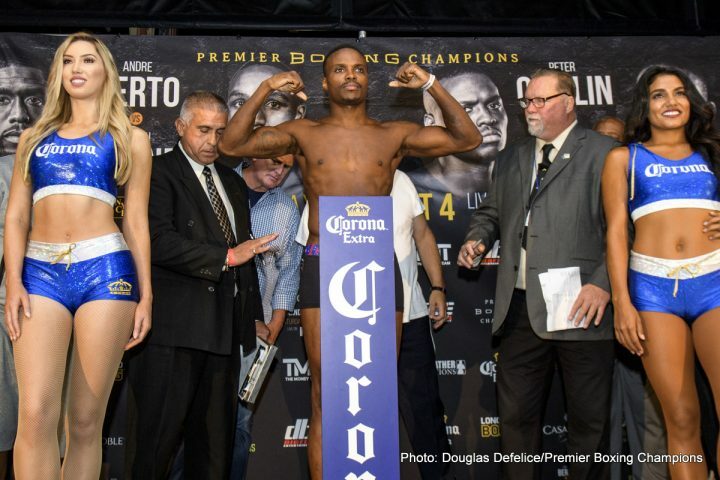 Quillin has to be viewed as the favorite to defeat Love, because he’s not much of a puncher. The guys that Quillin has had problems with during his 13 year pro career were big punchers in Andy Lee and Daniel Jacobs. Love can’t punch, which makes him utterly safe. Love wins his fights by decision most of the time. Love’s only loss of his career came against the hard-hitting Rogelio Medina I August 2014. Medina stopped Love in the 3rd round. Love fought to an eight round technical decision to Abraham Han in September of last year. Quillin would be better off moving back down to 160 if he could find a way to still make weight for the division, because he doesn’t belong at 168. What made Quillin so good when he fought at 160 was his size advantage over his opponents. Now that Quillin is at super middleweight, he no longer has the size advantage over his opponents, and that in turn has made him very, very beatable. As of year, Quillin hasn’t fought a good super middleweight since moving up in weight. Quillin’s only fight at 168 is journeyman Dashon Johnson, who he beat by an eight round unanimous decision last September. Quillin hasn’t been particularly active in the last four years since vacating his WBO 160lb title in 2014. It looks to some boxing fans that Quillin has lost his desire to compete. You’ve got love the sport if you want to compete at the highest rungs and it doesn’t look like Quillin wants it badly enough to fight at a high level. 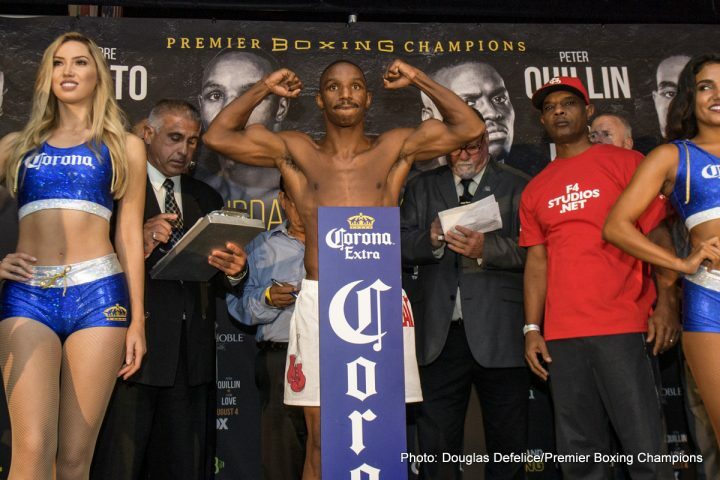 It wouldn’t be surprising if Love pulls off a minor upset and beats Quillin on Saturday night. That’s how bad Quillin is at this point in his career. He’s really slipped from the fighter he once was 10 years ago. 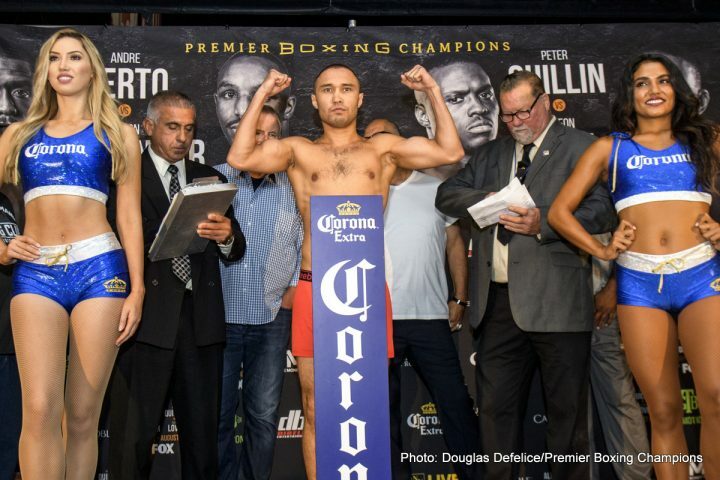 Former IBF light welterweight champion Sergey Lipinets (13-1, 10 KOs) weighed in at 148.8 pounds for his fight against welterweight Erick Bone (20-5, 8 KOs). Lipinets, 29, will be fighting for the first time since his 12 round unanimous decision loss to Mikey Garcia on March 10. Lipinets lost his International Boxing Federation 140lb title in that fight. It’s unclear why Lipinets is fighting at welterweight, as he lacks the size and punching power to compete against the best fighters in the 147 pound division. He’s not likely to do too well fighting against guys with more size than him. The 29-year-old Bone weighed in at 146.6 pounds. Bone has won his last four fights since losing four consecutive fights to Eddie Ramirez, Miguel Vazquez, Chris Algieri and Shawn Porter. You have to feel a little bit sorry for Bone, because his management put him in against four very good fighters in a row without letting him take a breather against a softer opponent that he could get a confidence boost against. Bone has done much better in his last four fights in beating these fighters: Cameron Krael, Humberto Toledo x 2 and John Merchan. Bone has looked a lot better against these guys. However, there’s a good chance that Bone will revert back to where he was at before when he faces Lipinets on Saturday night. This is a tough match-up for Bone on paper. Hes not a big puncher and he’ll need to have some power to keep Lipinets off him.